Currently I’m real deep into writing my diploma paper (after finishing the software programming part) and thought it would be a great time to update my personal Top5 chart again. You can check out my Top 5 Chart of November 2008 right here! What are your favorites of Tic Tac Trance #011? Episode 11 of Tic Tac Trance on November 8 will be a Specialedition! I decided to play some of my favorite tunes from Ferry Corsten’s new album “Twice In A Blue Moon”. And before you ask: I don’t get payed to play the tunes or to promote them, I simply do it, because I love the tracks so much! But don’t worry, I’ll also play in the first hour several new tracks which are currently very high in my favoritelist and of course the webvote winner of the previous show! 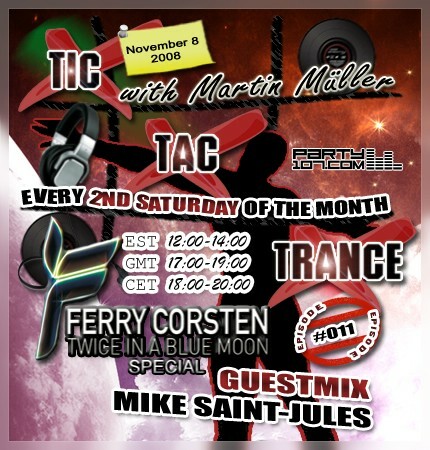 The second hour of Tic Tac Trance #011 will feature an exclusive guestmix from Mike Saint-Jules! He’ll spin some of his favorite tunes at the moment and some surprises aswell. Make sure you’ll tune in! The show will start TODAY at 18 CET / 17 GMT / 12 EST. Check out your local time HERE!